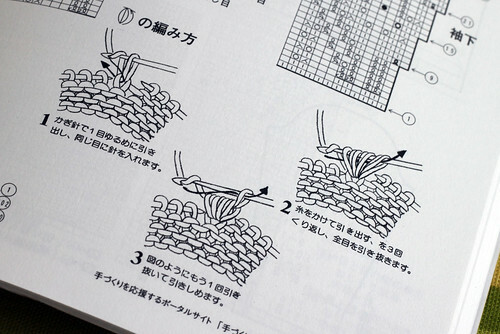 Here is a photo of the page that shows the way to make a crochet cluster into a knit stitch. It is from a Japanese publication called “Let’s knit series”. I am trying to make this stitch work, consistently. It works nicely sometimes, on one side nice, on the other all loopy. It also tends to stretch out the stitches next to it. Tomorrow I will share another interesting stitch which I may use instead of this one for the buds in the leaf sock I am trying to knit. This entry was posted on Saturday, June 20th, 2009 at 3:00 am and is filed under Crochet and Knitting. Tagged: Crochet, Knitting. You can feed this entry. You can leave a response, or trackback from your own site. Hi there! The photo is not showing and when I click on the blank space it takes me to a flickr page that says,”OOps, the photo you are looking for has been deleted. You may want to ask Yarn Journey about it.” So, that’s what I’m doing….asking you what happened to it!? LOL! Hi TattingChic, I had some trouble with the photo upload to flickr. The photo came through on my computer, so I can’t tell exactly what is happening. I went back to flickr and deleted the old link here and then redid the link to the photo that shows on flickr. I hope it works now. If not, let me know and I will download a new photo and try that. Thank you for letting me know there is a problem. Ah, I can see it now. Thanks.